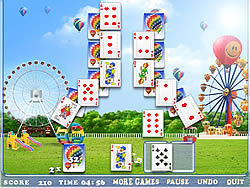 Park Of Happiness Solitaire Game - FunGames.com - Play fun free games. Park of Happiness is a fun game new free online variation of the popular fun game patience by Cooking-Free-Games.com The object of this fun game is to place all cards from the tableau to the foundation. You can move two cards of the same rank.There are 20 levels and bright high quality graphics that make this fun game even more addictive!